"This is really an opportunity for everyone across the university to pull together their collective resources..."
Christian Johnson is getting comfortable having his picture taken. 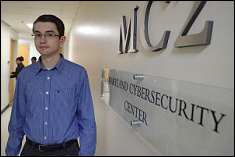 The freshman computer science major has garnered attention from the likes of The Wall Street Journal (“they told me not to smile”) and is among the rising young faces in a new generation of cybersecurity specialists. His resume includes positions such as NASA big data specialist, CEO of a computer company he founded in high school and student board president of this university’s Advanced Cybersecurity Experience for Students honors program. In February, the 19-year-old was chosen as the lone undergraduate student representative in the President’s Task Force on Cybersecurity. But if the thought of working in the wake of February’s massive data breach with experts decades his senior scares him, he doesn’t show it.